WordPress is a complete package. It is open source, and you can do everything that you want in WordPress. If you are a music lover and want to create an online music blog, you are set. The WordPress comes with all the tools that you need to bring your music blog to life. However, it is somewhat limited. This is where the plugin ecosystem kicks in. 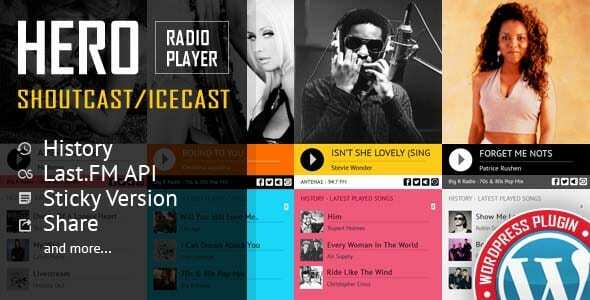 In today’s article, we will list the best WordPress Audio Player Plugins, both free and paid. These Audio WordPress plugins will help you to create a better music-related content. Not to mention, with the plugins, you will be able to incorporate other music audio formats including WAV, WMA, MP4, MP3 and so on. As we go through the article, you will find that some plugins come with Layout Builder. A layout builder helps you to create customizable audio players to enhance user experience further. However, most of the plugins are not free to use, and you need to buy them. Also, most of the plugins that we are discussing today are localized, and you will not have any issues delivering your content to an international audience. Also, these plugins will support modern web browsers including Firefox, Chrome, and others. Audio Dock is a powerful and feature-rich Audio Player for your WordPress website. As you can guess, it will allow you to play music on your site. Furthermore, it is completely free to use, so you are not losing anything to try it out. You will be able to add an unlimited number of tracks, add your custom titles, choose any color for the bar and track, and much more. If you are an artist/musician looking to gain online exposure using your website, then this is an excellent plugin to keep on your site. If you are opening a podcasting website, then you should not anything beyond PowerPress Podcasting plugin. It is a fully featured, easy to use podcast plugin. It comes with SEO compatibility, subscribes options, and also enable you to host podcast the way you want. This WordPress Audio plugin is extremely popular with over 60,000+ active installations at the time of writing. Not only that you can create episodes and then submit them to iTunes and Google Play. It also comes with two modes: simple and advanced. The simple mode simplifies the whole process whereas the advanced mode offers more option, giving the options. This WordPress audio player plugin also doesn’t take a lot of the website real estate as it is compact. Not only that, but you can also provide a preview to the visitors who are interested in your music! That’s a bonus as it gives you the tools to monetize your website to the right audience. The plugin also comes with the option to use shortcodes giving you more control over your player. The winning point for this plugin is the simplicity it offers, regarding both the features and user experience. 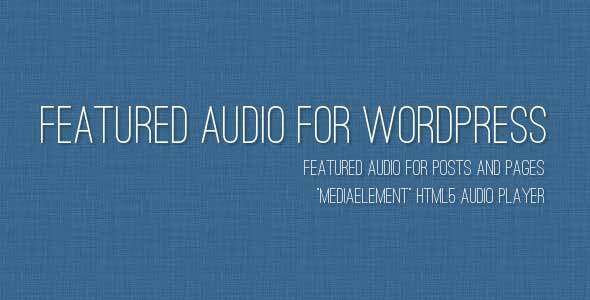 MediaElement.js is one of the most popular WordPress audio player plugins out there with 20,000+ installations until now. The plugin is easy to use and let you create a not audio player, but also a video player. This versatility can give you an advantage when it comes to managing your website as sometimes you might want to include a video to go with the music. This WP audio plugin is easy to use and offers simple interface. Unlike other plugins, you can include both audio and video files directly from the post editor. You can also use the shortcode if you want to. The default player is also simple. Other than that, you can disable/enable progress bar, provide basic playback options and disable fullscreen as well. However, don’t expect too much from the plugin as it has limited customizability attached to it. Overall, a great free plugin that will let you get started with your work. ZoomSounds is a trending Audio player plugin for WordPress. It is also one of the best-paid plugin out there with over 1690+ sales. However, the rating is a little on the lower side. The best part of the plugin is the fact that it comes with all the features that let you make your website audio friendly. The interface and design of the audio player are attractive. It also comes with wave skin and no heavy dependency on one single audio format. Just like the free plugins, you can use it with shortcode as well as from the dashboard. It also supports SoundCloud. Starting out with the plugin is easy with one click imports. The visitors can like and comment, making it more socially friendly. Other key features include playlist creation, WooCommerce support, and eight skins for the audio player. 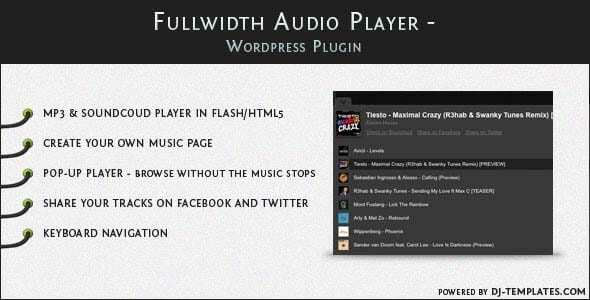 The fullwidth Audio player plugin is a unique audio plugin for WordPress. First, you can add an audio player anywhere on a page or a post. This means that you can add it at the bottom, top or as a pop-up. Yes, you read it right. This one aspect gives the plugin the best selling point as the visitors can pop-up the player and let it run in the background. It is all about giving more flexibility to your visitors. This WordPress audio player plugin also supports track sets, single tracks, and user tracks. You can also integrate audio files from SoundCloud. The plugin is also highly customizable and offers social features. 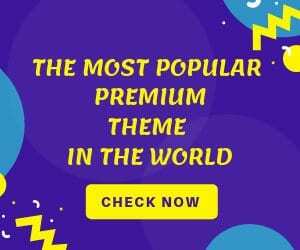 Everybody loves SoundCloud, and now with this plugin, you will be able to integrate SoundCloud’s official audio player onto your WordPress website. Once you have installed “SoundCloud is Gold” to your site, you pretty much have access to all the tracks and playlists available on the online audio distribution platform. This audio plugin for WordPress allows you to browse through all available tracks on SoundCloud directly from the comforts of your WordPress dashboard. Then with shortcode and widget support, you pretty much have complete liberty to place the audio player and play tracks anywhere on your website. As you might guess it from the name, it is an audio player that supports audio file waveform while the playback is going on. With the plugin, you can host tracks or simply integrate it from other cloud hosting services such as SoundCloud. WavePlayer is probably the best modern player out there. It can also be used for podcasting purposes. Other key features offered by WavePlayer is HTML5 support, responsive design, WooCommerce integration and so on. You can also visually create the playlist before publishing it. One more key feature is that it is fast and efficient and doesn’t slow down your website. Next up we have the MB.MINI Audio Player plugin for WordPress. The plugin allows you to insert audio files into your content easily. All you have to do is merely upload an mp3 file into one of your posts, and the plugin will automatically transform it into a small HTML5 audio player. You will also have access to some customization options to let you decide how you wish the audio player to look and function. You will also be getting volume controls, seeking controls, title bar, with the plugin and not to mention buttons for rewind, mute and play. HTML5 jQuery Audio Player lets you insert audio files and focuses on providing an overall feature set compared to other audio player plugins. With this WordPress Audio player plugin, you can manage songs and add both Ogg or MP3 format. Not only that, you can add other vital information about the songs such as the artist, title information and rating. 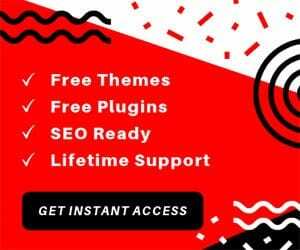 This WP audio plugin can be used with Easy Digital Downloads which means that you can sell your songs to the visitors and create a revenue funnel for your business. However, the plugin is far from being perfect. It’s user interface can be improved and also the way you audio player looks like. Despite all this, we think that the plugin is a good choice and give you added features. 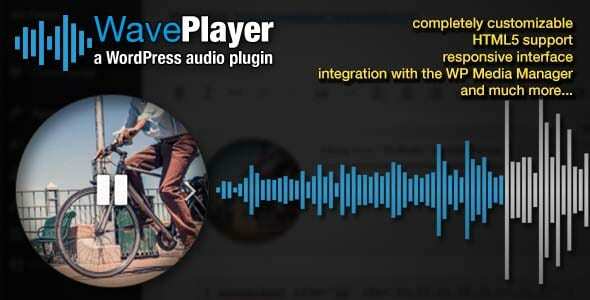 tPlayer WordPress plugin helps you incorporate a responsive audio and radio player on your website. The audio player is highly functional and supports extensive customization possibilities. The plugin can also show details about the audio and radio stream, as well as show you statistics regarding users audio listening habits. The plugin supports unlimited playlists and unlimited tracks on each playlist. You will have the option to fetch these songs from external storage systems like Google Drive, Amazon S3 and so on. There is the autoplay feature which will start the radio, or a particular audio file as soon as a reader visits a page or a post. And then there are plenty of other customization options to help tweak how the audio player looks. Disk Audio is yet another WordPress audio player plugin which can help you display an HTML5 audio player right onto your website with a press of a button. The audio player is complete responsive in design so mobile users will be able to enjoy its functionalities without any issue. On top of that, there are plenty of customization options regarding color schemes, skins, background images, and opacity. Coming to its feature list, the plugin allows you to display your music playlist along with an adjustable scrollbar. You can also embed download links onto the music player which will show users where they can go to buy the current track that is playing on your website. Option for keyboard control is also there, and you like, you can turn on autoplay functionality to surprise your audience with a great track. Featured Audio is a premium audio player plugin for WordPress website which functions similarly as to featured images. Just as with featured images you can assign a particular image to a page or post, likewise with this plugin, you will be able to attach a “featured audio” to a page or post. Once one of your readers enter the page or post, the audio file which you assigned will begin to play through a powerful HTML5 audio player. You also have some control over where you wish to showcase the audio player, and you get five different positions for it. The supported audio formats include mp3, wav, ogg, and a few more. Audio Album is a free to use WordPress audio player plugin. It is primarily aimed at the easy creation of audio albums which can be used anywhere on your site. It takes advantage of the mediaelement.js and extends the functionality that WordPress has to offer. However, this doesn’t mean that you cannot add single tracks. To use this sound plugin, you need to use the shortcode that it comes with. It also provides a simple-to-use stylesheet where you can add new tracks or do media player customization. With CP Media Player installed on your WordPress website, you will have the option to publish a video and audio player anywhere on your site. This WordPress audio player plugin is based on the powerful MediaElement.js which means it will work perfectly on any browser that follows all the modern HTML5. Also, thanks to Flash and Silverlight, the old browser should also be able to render the media player. Now coming to the feature side of things, the plugin has support for a wide variety of audio and video files, namely MP4, OGG, WebM, WMV, MP3, WAV, WMA, FLV and WebSRT subtitle files. Then there is the option to associate a playlist to your media player, and even customize it with skins. A premium version to the plugin is also available which brings in plenty of other features as well. Royal Audio Player is probably one of the most flexible and feature-rich audio player plugins for WordPress websites. The plugin has been crafted to run mp3, and YouTube video on your WordPress website. It is also super customizable and is compatible with every WordPress theme on the market. Some of the distinct functionalities offered by the plugin include the option to create a popup player in a separate window so users can enjoy the music while browsing other websites. The playlist functionality is also filled with plenty of cool options including the option to categorize your music. Besides this, you will get social share integration, the option to password protect specific tracks, a search bar and sort menu for your music, and much much more. 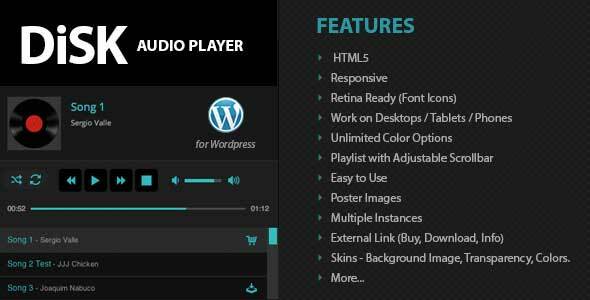 As the name implies, this plugin provides you with a fully featured HTML5 audio player for your WordPress website. Currently, the plugin has only support for mp3 and ogg audio files and is primarily designed to help you add background music to your website. Besides this, there are plenty of customization options to help you tweak how the audio player looks and functions. On the feature front, the plugin supports automatic folder reading which helps to generate a player playlist by searching our all mp3 files. Then you will get access to a plethora of options to help you control the audio player, which includes: a button for rewinding, play, previous track, next track, mute, volume slider, timer, buffer, and so on. The plugin also supports shortcodes which means you the option to place it practically anywhere on your website. The Hero plugin is a simple to use audio plugin for WordPress. It also supports radio streaming. The plugin also supports Shoutcast and Icecast. Other than that, the plugin is completely responsive and offers great customizability. You can choose from two skins: white and black. However, this doesn’t limit the customizability as you can add colors using color scheme. The radio player can also be sticked to give visitors a better audio experience. As the Shoutcast streams go on, users can simply use the history option to listen to the old content, making it a great choice. The plugin also supports social media. In short, a great plugin for the more than 30+ customizable options. Simple Music Widget, as the name suggests, will help you to create a music player widget for your WordPress website. The widget allows you to play audio files on your site, and set it to any widget area on your site. It is also very much functional and can display the artist name, cover name, and a short description of the song, along with the song name of course. Now to speak of other functionalities, the widget is fully responsive which means mobile users will have no problem enjoying it. Then there is an inbuilt option which allows you to upload cover images and audio files to the widget, or use external cover image URLs or audio file URLs if you want. Any Other WordPress Audio Plugins? We conclude the article with twenty best WordPress audio plugins. We listed both free and paid plugins, and we are sure that you will find the plugin that you are looking for! Still confused? Comment below and let us know. i am using #16. 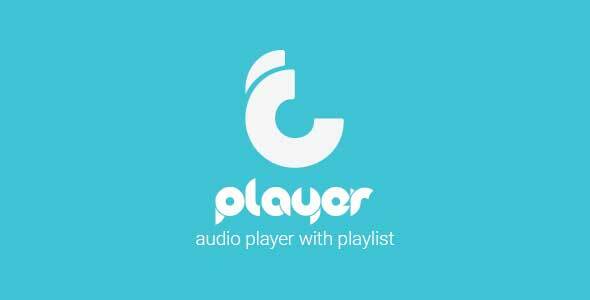 HTML5 Audio Player WordPress Plugin on my site, but its not free i have paid for that but this is best player ever you can download and share. is it easy to create and change playlists in that player you use? can anyone recommend an audio player where it is very easy to create and change playlists/running order frequently? the players that i have tried all are quite tedious to work with.